It is without a doubt one of my favourite restaurants in Lisbon. Located next to downtown Lisbon and with Martim Moniz as a backdrop (one of the oldest part of Lisbon, near Castelo de S. Jorge), Infame absorbs the multiculturalism that surrounds it at the 1908 Lisbon Hotel. 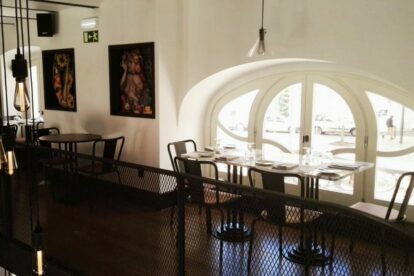 The restaurant has a decoration full of colours and every element has a special meaning. The chef has created an inventive kitchen that absorbs various sources and influences, celebrates the multiculturalism of Lisbon, and the Intendente in particular, a neighbourhood where different nationalities and cultures come together and coexist; almost 80 nationalities coexist in that specific parish. The ingredients from Indian and oriental cuisine are the stars in almost all the dishes that blend the flavours from the four corners of the world, and you will never know what you will be eating because the chef changes the dishes almost every day, according to the fresh ingredients that he finds at the local markets. The daily menu takes us on a journey through the palates of the world, without losing the local roots of the greatest Portuguese cuisine and at the end of the meal you just want to start all over again. It is the perfect spot to go if you want to get to know Lisbon’s melting pot and eat great food at nice prices.